This design for the monument of William, 3rd Duke of Hamilton was commissioned by his widow, Anne, 3rd Duchess of Hamilton, from James Smith, the architect working on the rebuilding of Hamilton Palace. It has been preserved in the Hamilton Archives ever since. 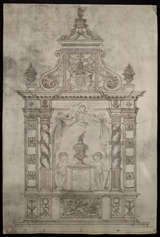 The monument, drawn on parchment with pen and ink, shows a tall structure with imposing columns, two mourning boys with extinguished torches flanking an inscribed plinth with an urn surmounted by a cherub beneath draperies. At the top is the duke�s coat of arms. The son of William Douglas, 1st Marquis of Douglas, the 3rd Duke of Hamilton fought in the royalist army in the mid-1650s and, in 1656 married Anne, 3rd Duchess of Hamilton in her own right. At her request, Charles II made him Duke of Hamilton. In parliament, the duke led the opposition to John, 1st Duke of Lauderdale, later serving twice as Lord High Commissioner. President of the Scottish Privy Council in the 1680s, he occupied other important offices including that of Lord High Admiral and was an extraordinary Lord of Session. An earlier design for his monument had incorporated full-length, standing figures of the duke and duchess, but this was not in keeping with Presbyterian ideas and so James Smith was commissioned to produce a new design without any effigies.